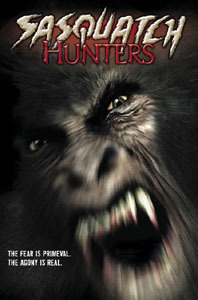 Screenplay: Click here to download the original Primeval (Sasquatch Hunters) shooting draft! This is the complete script, and contains scenes not included in the final film. The file is in Adobe Acrobat format (PDF). Visual Effects Demo: Click here to see how we added a digital face to the creature suit used throughout the film. The video is a little over 4 minutes in length and is in Windows Media format. It is 8 megabytes. Visual FX Article from VFX World. Interview with Producers Fred Tepper and Tom Zimmerman on MovieWeb. Entertainment Weekly puts SASQUATCH HUNTERS on their "Hit List." Click the image to see the list.